Life can be stressful (understatement of the century?). Between wrangling your morning commute, chipping away at your never-ending to-do list, and somehow maintaining a semblance of work-life balance, it can be hard to take a moment to just breathe. But when you try to clear your mind for a meditation sesh, somehow you’re flooded with thoughts ranging from your weekend brunch plans to that embarrassing moment in yesterday’s Pilates class—all at the same time. Relax, you’re not a meditation failure. 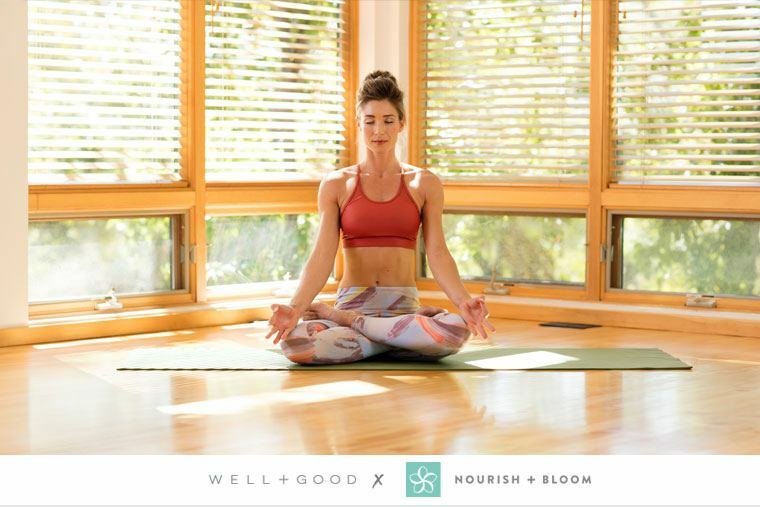 Mindfulness pro Rosie Acosta, a contributing expert to women’s wellness site Nourish + Bloom, says it’s never too late to start. And that doesn’t mean you need to wake up at 4:30 a.m. to get in your dose of mindfulness (like Acosta does). The key, she says, is not making the practice a stressor for yourself—especially if being super busy is why you’re seeking it out in the first place. To start, Acosta recommends three methods based on your current emotional state, where you are physically, and how much time you have. Overall, the important part is to tune into the present, a skill Acosta says is the key to creating a healthy relationship with yourself. Below, Acosta shares three simple techniques to get more meditation in your life—and you can also score her in-the-moment wisdom on the N+B Life app. Keep reading for three easy methods to help you start meditating on the reg (for real this time). 1. Start off sitting, standing, or lying down, and set a timer for three to five minutes to give yourself one less excuse for distraction. Close your eyes (or leave them open, focusing on a single point) and pay attention to the inhale and exhale of your breath. 2. Begin creating a pattern with your breathing by inhaling through your nose for four seconds, pausing, then exhaling for five seconds (the longer exhale encourages your parasympathetic nervous system, which regulates stress, to calm you down). 3. If your mind strays, acknowledge that gently and bring it back to your breathing pattern. 1. Settle in for 10 to 20 minutes. Ideally, body scans should be performed lying down, but the method can also work seated (even in your office desk chair). If you’re able to lie down, relax on your back in a position similar to yoga’s savasana pose. 2. Close your eyes, and begin to bring awareness to your body by methodically breathing in and out. Then, take inventory of each area on your body starting from your toes up, noticing any tingling, tightness, and differences in temperature. 3. Focus on the backs of your heels, legs, seat, the part of your upper back that’s touching the ground, your upper shoulders, the backs of your arms, hands, and the back of your head. 4. Reverse the scan back down, and then repeat the process focusing on the front side of your body. Don’t rush it, or force yourself to feel anything. Just be there with your body. Acosta recommends this targeted meditation for moments when your mind is flat out too busy for a simple breathing break. “I think that for people who want to have meditation with a purpose, it’s a really loving, self-affirming way to enter meditation,” she explains. 1. Assume any comfortable position in a quiet place for 10 to 15 minutes. Close your eyes, relax your shoulders, and imagine you are softening the areas around your heart. 2. There are four traditional phrases you can begin saying to yourself: “May I be filled with love, may I be safe from harm, may I be well, and may I be happy and free.” Breathe in and out as you repeat these phrases and hold an image of yourself in your mind, as if you are saying these words directly to yourself. 3. You will begin to feel a sense of ease as your body lets go. It’s also totally normal for this practice to feel awkward or to stir up irritating or upsetting feelings—but that’s okay. The important thing is to be patient and kind to yourself, by acknowledging your feelings and moving on. 4. Once you’re comfortable with the self-love affirmation (which can take several sessions—don’t push it! ), you can extend the meditation to others, filling in their name in each mantra.